Browse thousands of economic, business and financial phrases defined by the Financial Times. Table notes	Although the headline ranking figures show the relative postions of each institution, the pattern of clustering among the schools is equally significant. Some 193 points separate the top programmes, HEC Paris, from the school ranked number 35. The top 7 participants, from HEC to ESCP Europe, form the top group of pre-experience Masters in Finance providers. The second group, headed by Peking University: Guanghua, spans schools ranked from 8 to 23, a range of some 37 points in total. Differences between schools are small within this group. The remaining 12 schools headed by Washington University: Olin make up the third group. 2. An average of salaries three years after graduation. The figure shown is in US Dollars, based on purchasing power parity equivalency. 3. The rank is calculated using alumni salaries three years after graduation and course costs. The length of the course is also taken into consideration. 4. The career status of alumni three years after graduation. Progression is measured according to level of seniority and the size of company in which they are employed. 5. The extent to which alumni fulfilled their goals or reasons for doing a Masters in Finance. This is measured as a percentage of total returns for a school. 6. 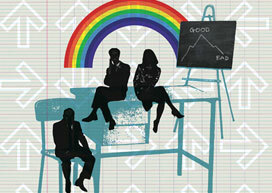 Alumni who used the careers service at their business school were asked to rank its effectiveness in their job search. 7. The percentage of the most recent graduating class that were in employment three months after graduation. The figure in brackets shows the percentage of the class for which the school was able to provide employment data. 8. Percentage of female faculty. 9. Percentage of female students. 10. Percentage of female members of the advisory board. 11. Percentage of faculty whose citizenship differs from their country of employment. 12. Percentage of students whose citizenship differs from the country in which they are studying. 13. Percentage of the board whose citizenship differs from the country in which the business school is based. 14. A measure based on changes in the country of employment of alumni between graduation and today. 15. Weighted average of four criteria that measure international exposure during the Masters programme. 16. Number of additional languages required on graduation from the Masters programme. 17. Percentage of faculty with a doctoral degree. 18. The length of the Masters programme. Data in this column is for information only and are not used in the rankings. 19. The percentage of the last graduating class that completed company internships as part of the Masters programme.